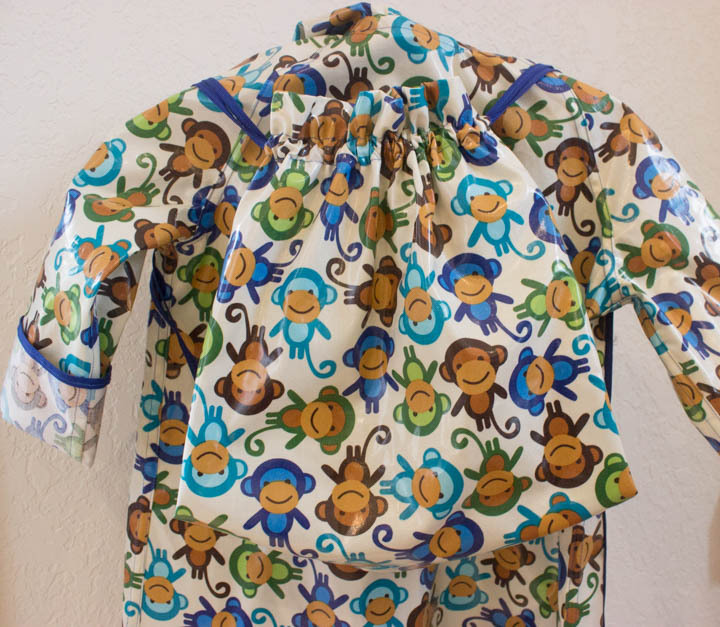 I wish I had a picture of my favorite monkey wearing this cute new raincoat. But toddlers are not noted for being highly cooperative. With photo shoot sessions, or much else, for that matter, so you will just have to use your imagination. All I can say is this fabric choice is perfect for my DGD. She is my favorite, super-active, always-moving, hilarious 3-year-old. And more fun than a barrel of monkeys! 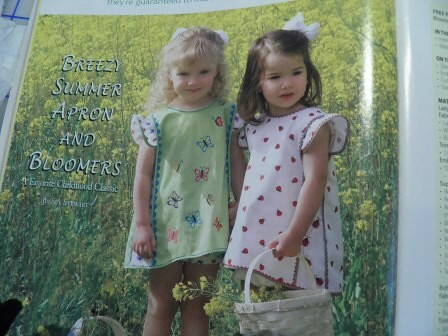 The pattern for this cutie is McCall’s 6392 (OOP). 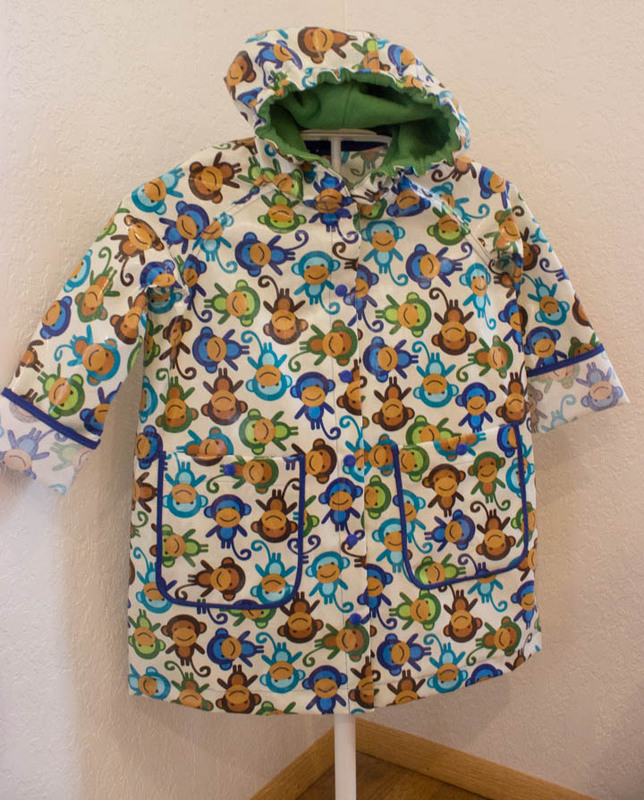 I stitched up only the raincoat and drawstring backpack—who the heck gives a 3 year-old an weaponumbrella? I contemplated making the hat, but figured that was just one more thing to lose. The backpack will probably get lost too, but since all little ones LOVE bags for their very important stuff, I made one up for DGD. 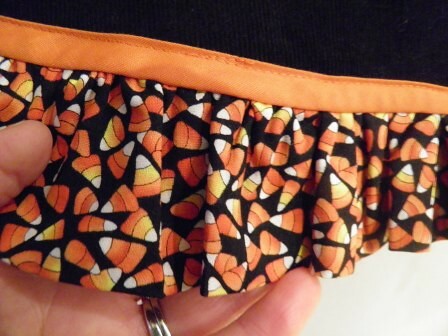 I don’t care that much if she loses something that took 15 minutes to sew. Of course, I had to make a few changes to the pattern. I added a bit of elastic to the hood so hopefully it will stay on her head. 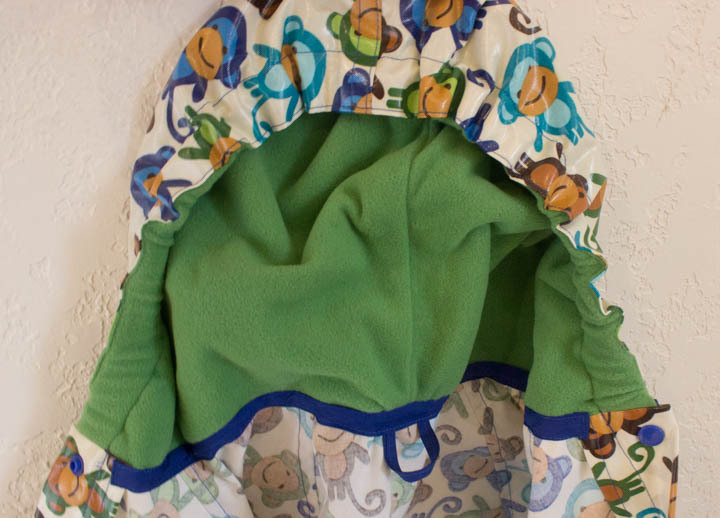 I also lined the hood with Polar Fleece 100 so it is cozy and warm around her ears. How do you like that “designer” neckline binding to hide the SA, and the coat hook loop. Snazzy, eh? 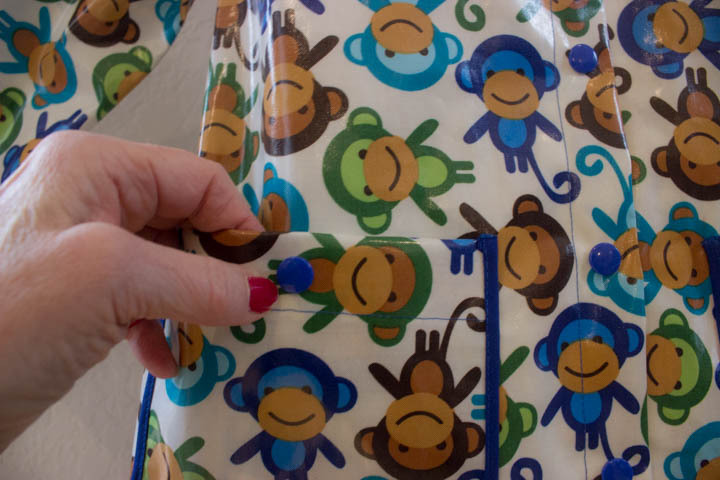 Just to add to my aggravation working with this laminated fabric, I felled the seams. 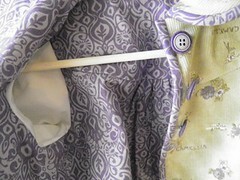 The old-fashioned way with a regular presser foot, wrong sides together, and trimming one seam allowance before turning and topstitching. I know. Only a grandmother is this crazy. But I wanted the inside totally finished and clean. And it is! Must.Have.Pockets. That kiddo is obsessed with pockets. 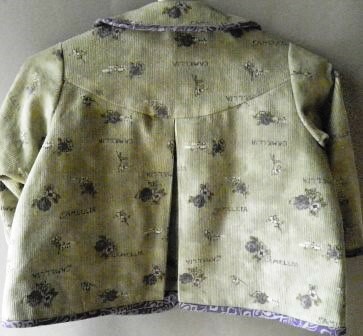 I drafted fairly large ones,and like the rest of the coat, trimmed them with narrow (purchased) bias binding. 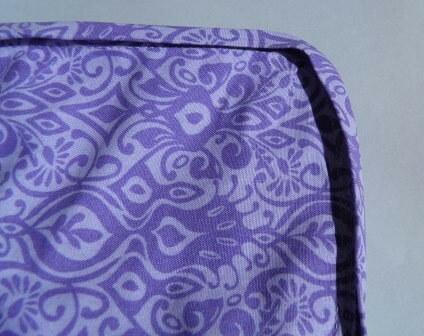 I love the contrast detail of the binding! And those KAM snaps totally rock. Many thanks to my friend Krista who loaned me her press and piles of leftover snaps! 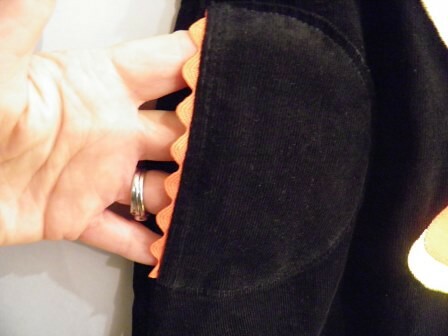 I think the snaps make the coat look way more RTW than Velcro, which is what the pattern suggests for closures. 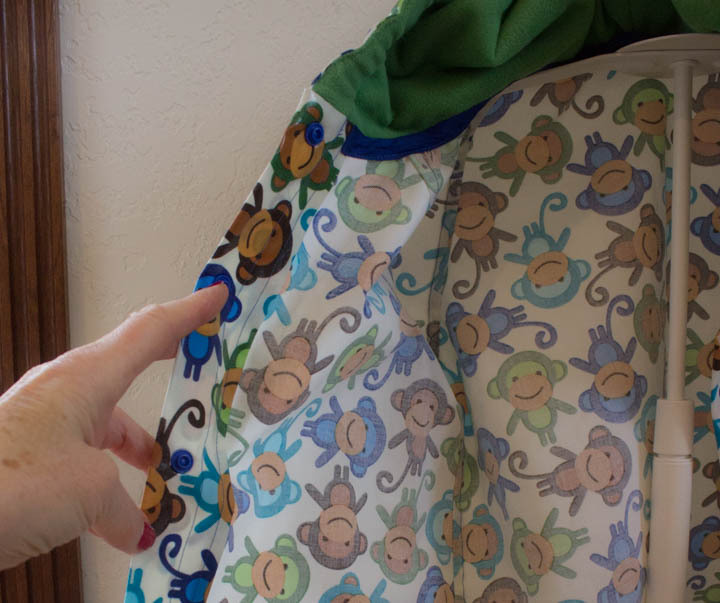 This is where there a pix of my DGD wearing her cute new raincoat belongs. Squint! You can see her in it, right? Maybe I can snap one someday soon and show you (again) how cute the little monkey is. 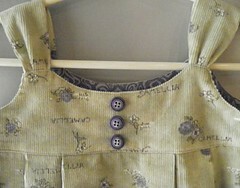 You might think that I have been sewing non-stop for my only grand-daughter since she was born. Well, you would be wrong. 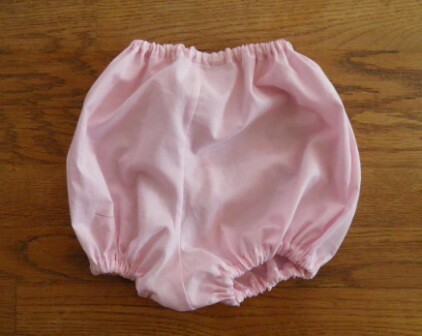 I have made her a few things, but I am not that enthralled with making baby clothes. 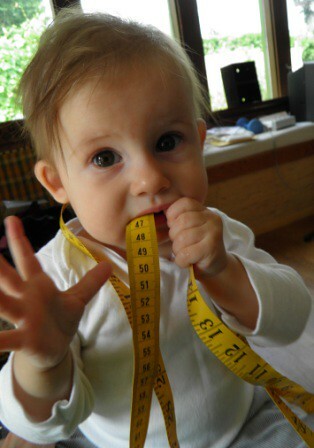 They grow so quickly that you can barely get something off the sewing machine before it no longer fits. 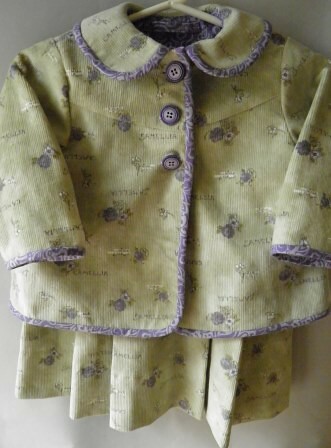 IMHO, buying used clothes from a consignment store is a much better way to dress little ones. Especially ones who go to daycare and return home almost unrecognizable they are so dirty. 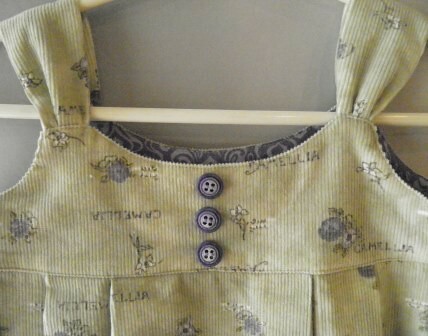 But now that my DGD is almost 2 1/2, I am starting to get a little more enthusiastic about spending my sewing time on her clothes. 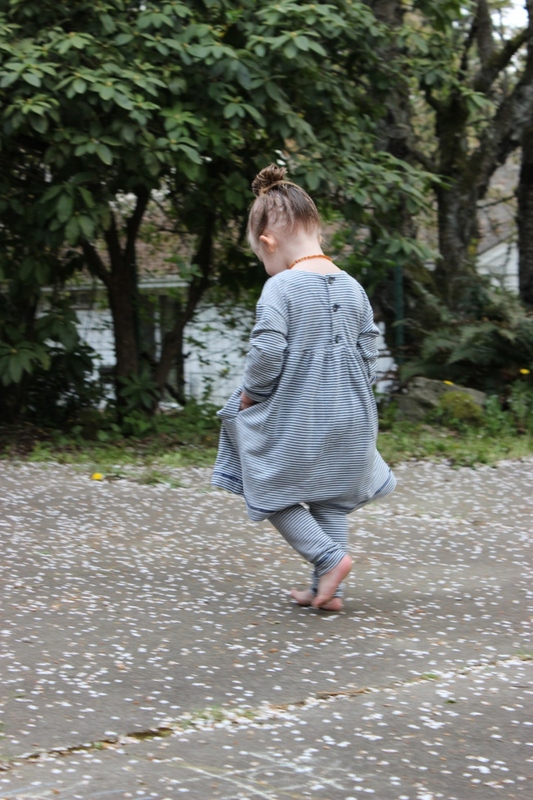 Plus I have been waiting to jump on the Oliver + S bandwagon, so I started with the Playtime Dress and Leggings in a soft, navy and pale grey striped knit. 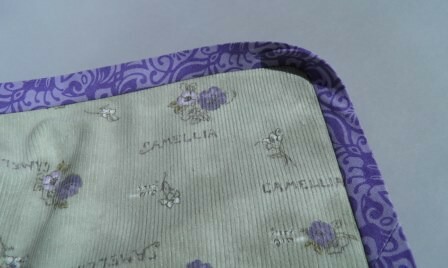 I am not sure of the fiber content as a friend gifted me with this fabric. 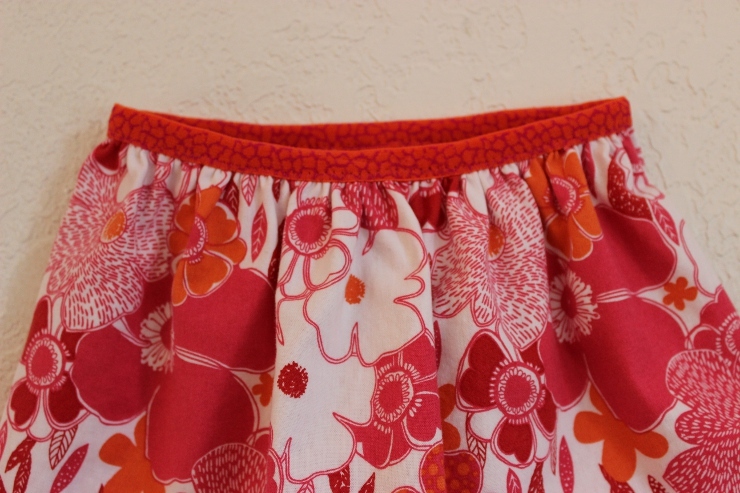 I thought little red ladybug buttons were a great embellishment, and decided to use the “wrong” side of my coverstitch for hemming the skirt and sleeves. 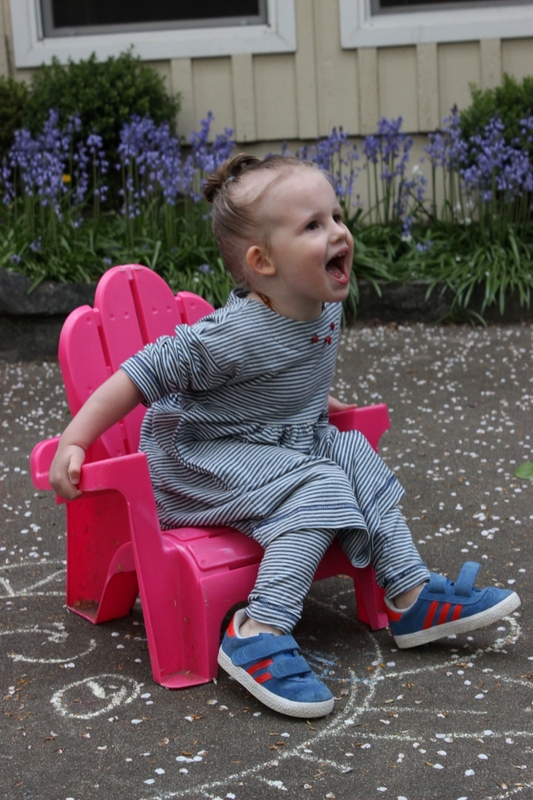 My DGD is a sporty, playful little gal, and this dress suits her down to a T.
Ohhh, pockets! Someone LOVES pockets! 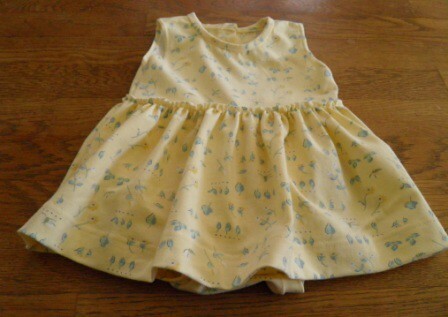 This dress is soft and comfy, Nana!It is really fun to stroll around in it! 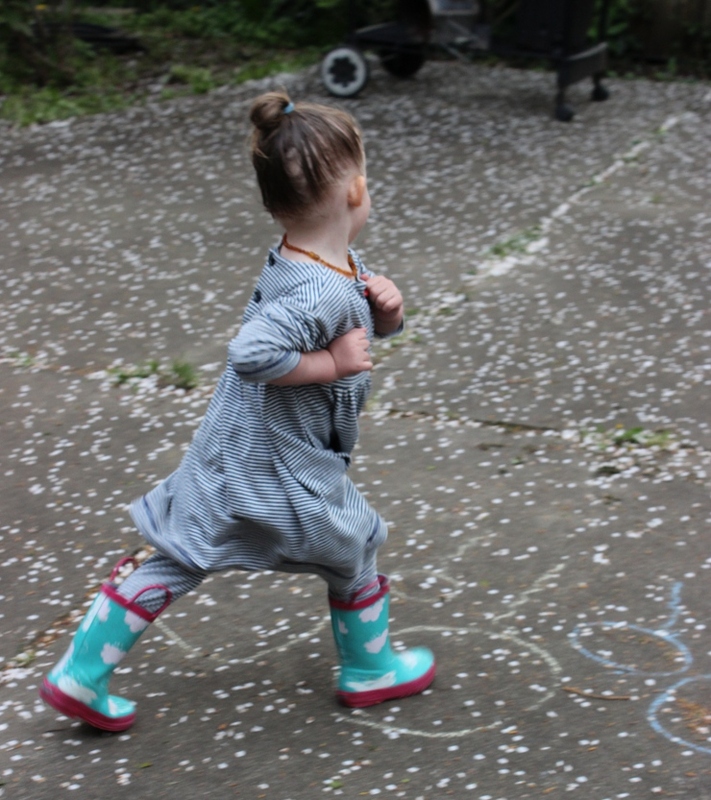 And if I put on my favorite boots I can RUN in my striped dress and leggings! Hey! There’s something on my tummy! Can you guess what it is? Hehe! 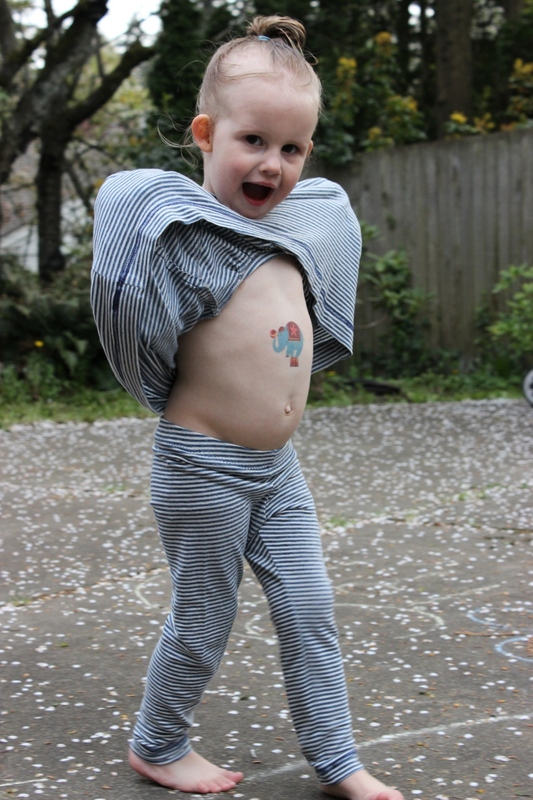 I bet you wish you had an elephant tattoo on YOUR tummy! 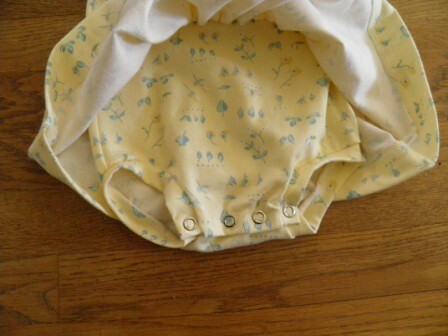 This little outfit sewed up quickly, and is adorable. Of course the model is even more adorable, but I am really happy with this Oliver + S pattern for my DGD. 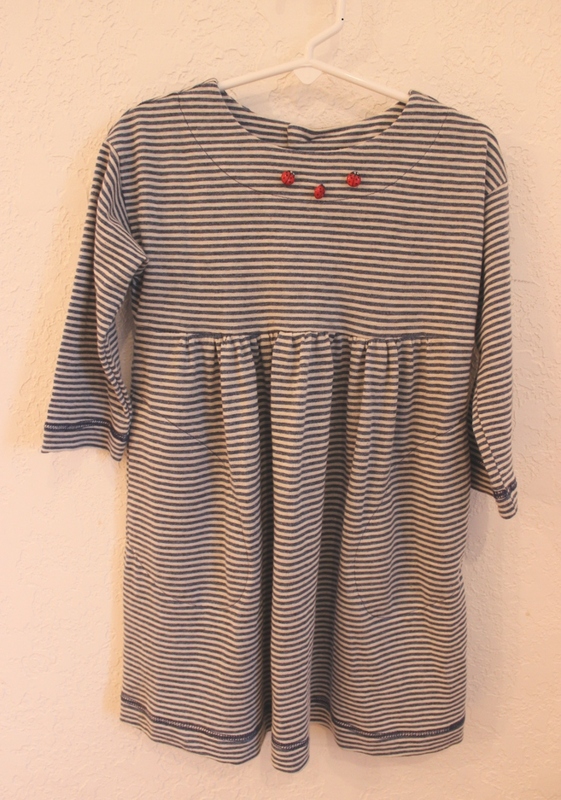 She really couldn’t get any cuter, but I love the playful, comfortable vibe of this fun little dress. 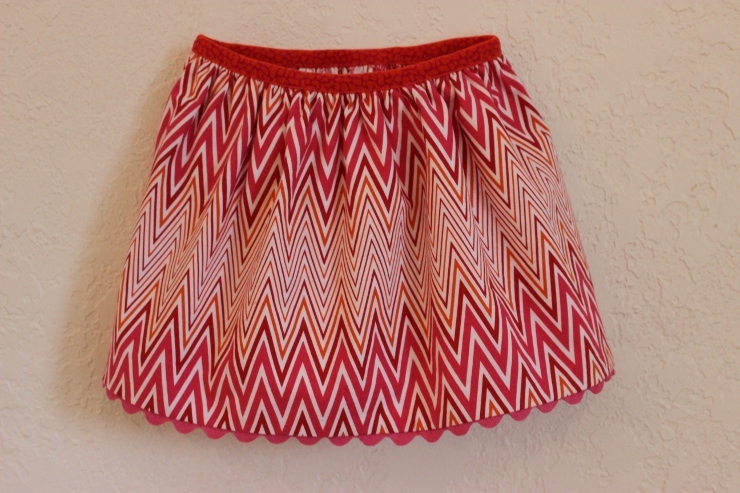 Have you made up any Oliver + S patterns? What did you think? I am a fan! Looks to me like some little mischievous imp is ready to cause trouble at daycare, but at least she is wearing her new leggings Nana made for her. I think the bows on the back (the ones that aren’t visible!) are adding that special feminine touch to her ensemble today. Don’t you agree? Still. Cutest. Best. 2-year-old. Ever. Happy sewing, and have a great weekend! 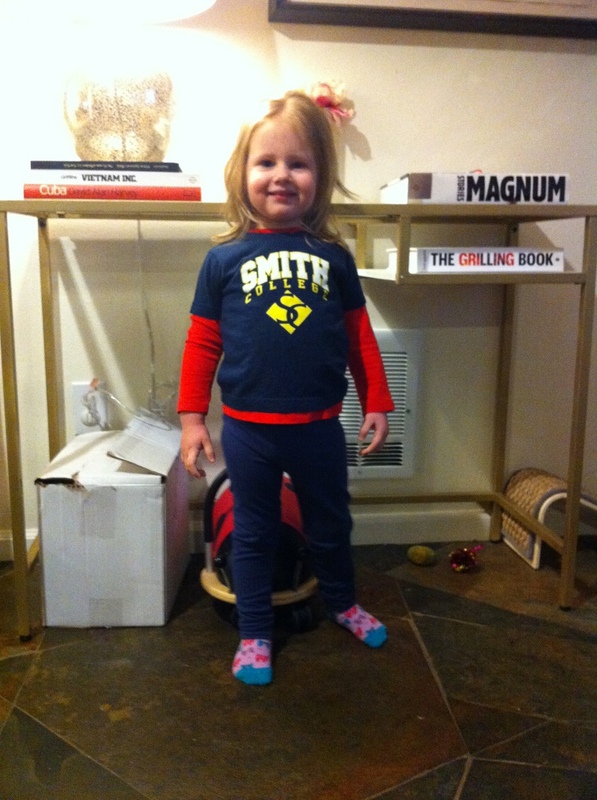 It seems my darling granddaughter is low on leggings that fit, so you can bet I jumped on that task immediately! 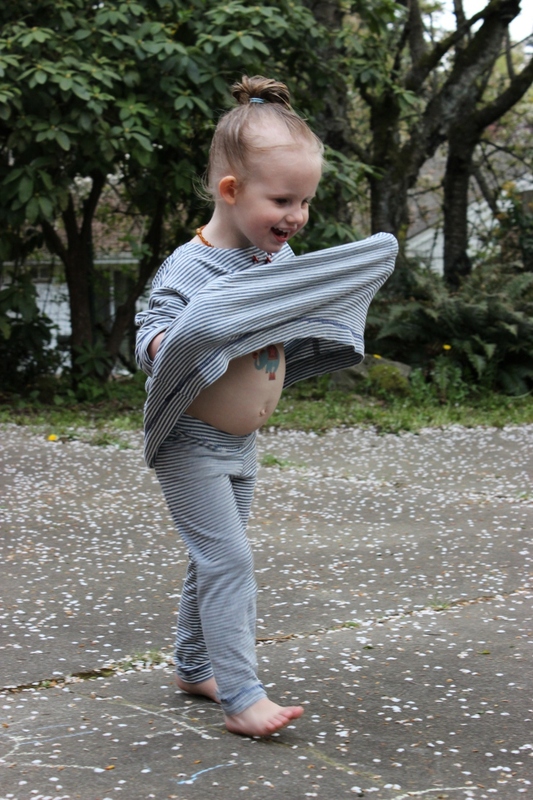 Thank you, Oliver and S for the cute Playtime Tunic & Leggings pattern. 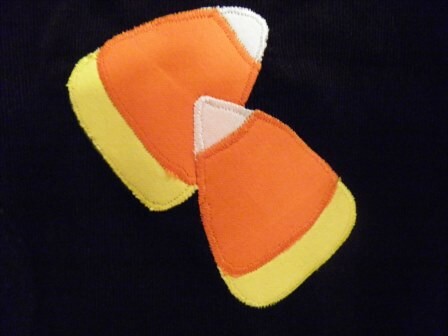 The best part about leggings for little ones is you can make them out of remnants from other garments. Yep, that’s exactly what these leggings are made from – remnants. I am pretty sure that qualifies as stash-busting, right? One pair of very plain, and very versatile, black leggings. One pair of hootchy, black lace leggings. NOT! Think of them as tights to be worn under dresses. Oh, wait. Oona isn’t wearing dresses these days. Well, maybe these tights will spur her to don a dress. Or not. And finally a pair of blue leggings with striped blue bows on the back. Someday there will be a Oliver & S Playtime tunic made out of the same blue striped fabric that can be worn with these leggings. Hopefully this tunic will magically appear before DGD falls down and rips a big hole in the knee of said leggings. I didn’t pay any attention to the instructions. 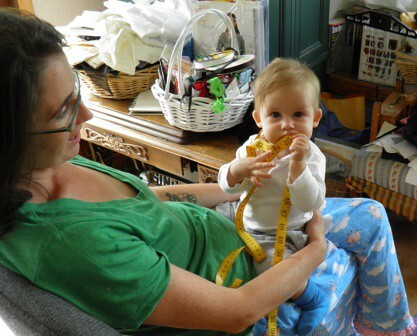 These are leggings for gawd’s sake – one pattern piece. 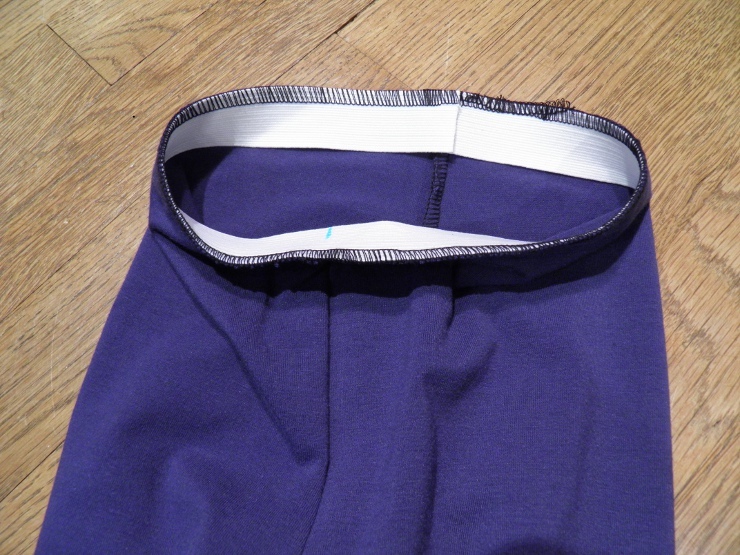 Serge the inside leg seams, the crotch seam, apply elastic with the serger using the 3-thread overlock stitch, and finally coverstitch the elastic waist and those teeny little leg openings. DONE! 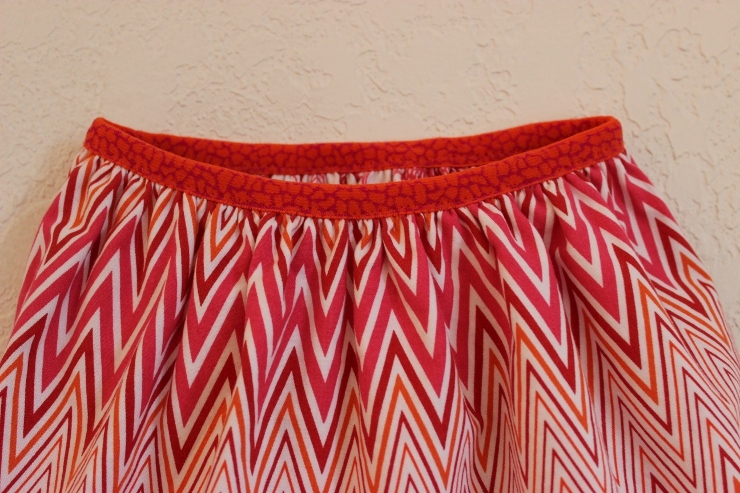 People who think sergers are optional really must be living on another planet, IMHO. 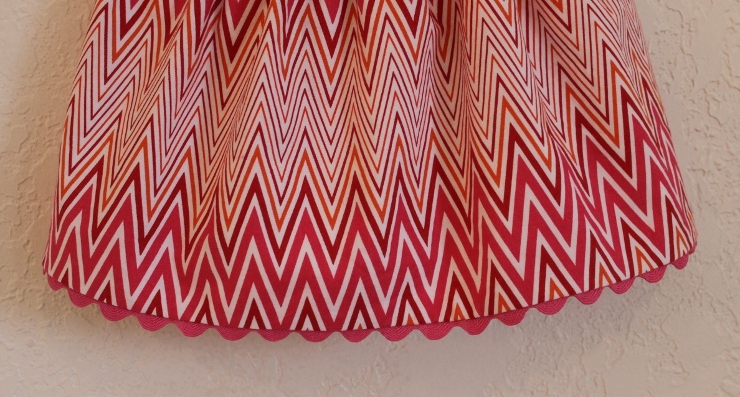 Could.Not.Sew.Without.A.Serger. I know, I know. You want to see a picture of DGD in these leggings. Have you ever tried to take a picture of a 2 year-old whose favorite word is “NO!”? Wish me luck, but don’t hold your breath. 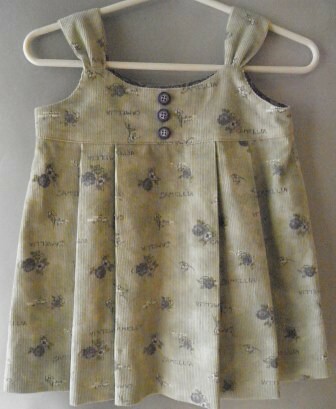 Sewing for little ones is so rewarding. 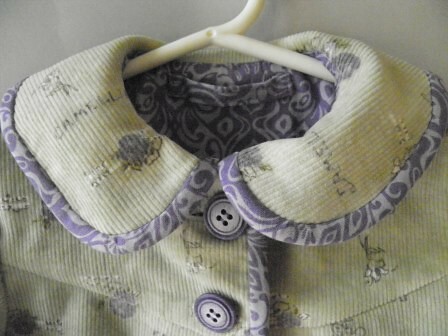 Generally projects can be made fairly quickly (OK, unless they are smocked! 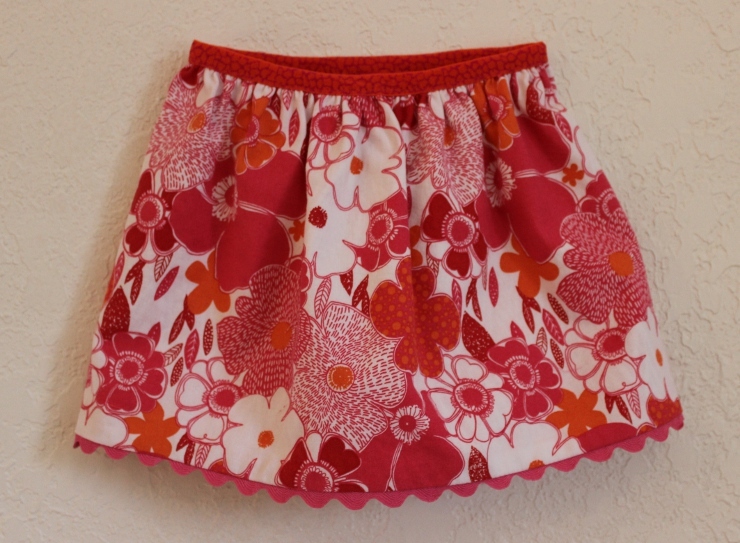 ), they don’t take a lot of fabric, and there are so many cute ways to embellish them. My DGD is now getting old enough (8 months today!) that the sewing opportunities and pleasure will only increase. 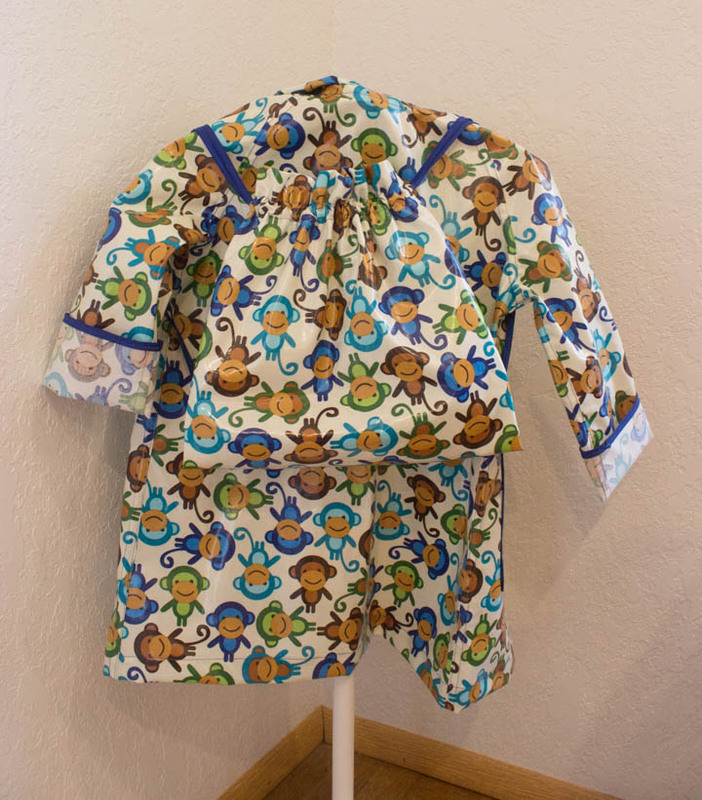 I am not one for making PJs and onesies for babies. 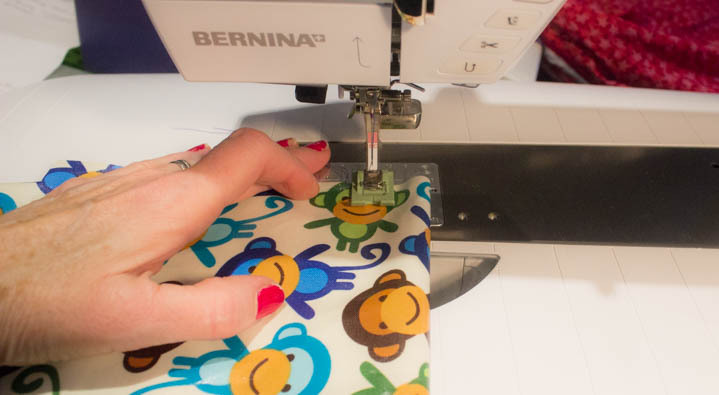 Not enough enjoyment factor to spend my sewing time this way. 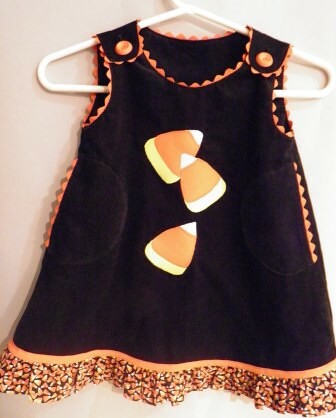 But a little onesie with an attached skirt to make it all girly and cute is a totally different story. I had some sweet yellow cotton knit that has been aging in my stash for just such an opportunity. Love this dress! Sorry for the weird angle on the above shot, but the dress is already on its way to NYC so no chance for a re-shoot. Check out the convenient little attached onesie part. Cool, huh? 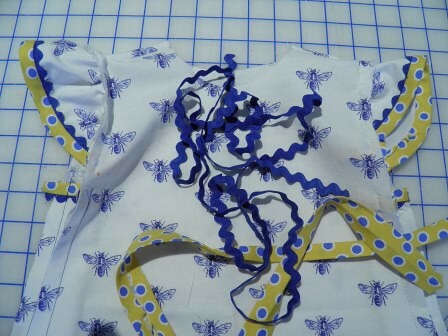 I think the dress will stay “put” on a wiggly baby who is not yet walking. 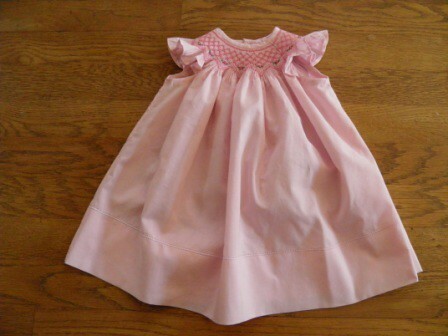 Of course the pink dress took more time, but I just love smocked dresses on little girls, especially bishop-style. 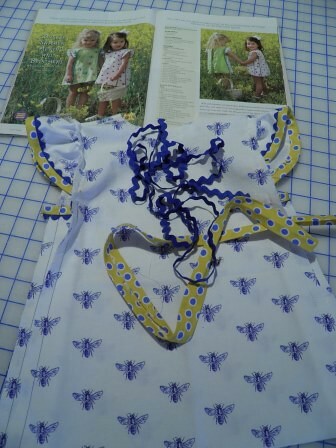 Oona is going to have a smocked dress in every size at every age – I really hope she likes dresses! 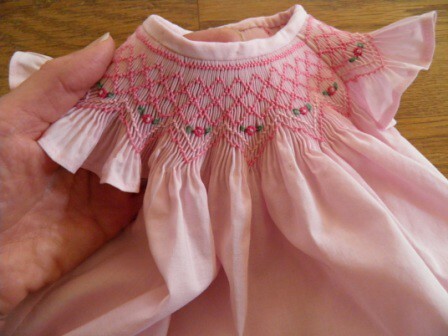 My smocking is not that perfect these days, as I am definitely out of practice. 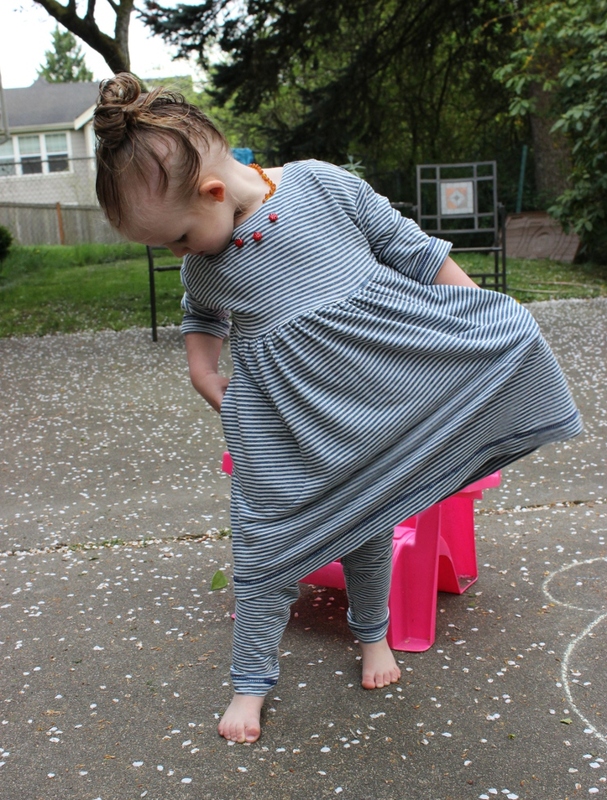 I see that changing soon, though, as Oona is getting into a “prime dress wearing age”. You have to take advantage of this time, since she might hate dresses once she starts school. Hope she and her momma like this one! I think my DGD is almost ready for sewing lessons, right? And she is definitely company in the sewing room, especially if Mommy is with her. Back to my semi-regularly scheduled posts next week.